'The Golden Axe', at the corner of St Mary Axe & Bevis Marks, near Bishopsgate. bl.uk > Online Gallery Home	> Online exhibitions	> Early photographically illustrated books	> 'The Golden Axe', at the corner of St Mary Axe & Bevis Marks, near Bishopsgate. Henry Dixon photographed buildings of Victorian London threatened with demolition for the Society for Photographing Relics of Old London. 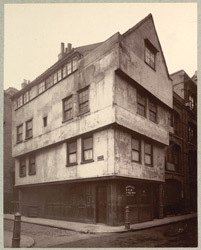 In the book 'Photographs of Old London' each image is accompanied by a descriptive letterpress by Alfred Marks, "This overhanging gabled house, of a kind fast becoming very rare in London, was destroyed in the course of last year." The street name 'Bevis Marks' can be seen on the sign in this photograph. It is named after the Bevis Marks Synagogue, which is a little further down the street. Opened in 1701, it is Britain's oldest synagogue. Today it is one of the best preserved houses of worship of its period and is still in regular use.